Himalaya Journey Treks & Expedition ::Expedition in Nepal, Mountaineering in Nepal. Expedition in Nepal is one of challenging adventure trip in Nepal.First successfully climbed Mt. Everest 8848m on 29th May 1953 by sir Edmund Hilary & Tenzing Norgey, aftermath highly increased for mountaineering in Nepal.For Nepal Himalaya expedition required phisically fitness,climbing skills as it has rocky mountains. The great Himalayan range in Nepal has eight out of fourteen of the world’s 8000 meter peaks with total number of 1310 snow peaks over 6000 meters and offers the best choices for Himalaya expedition and mountaineering in Nepal. Whether the interest is simply climbing a peak or an expedition on 7000 or 8000 meter peak, climbing Himalayas in Nepal has become a dream for most of the adventure enthusiasts and mountaineers in the world.We have the expertise to organize full scale Himalaya expedition as well as logistic support for climbing on peaks in Nepal & Tibet under the expert management of famous mountaineers.Expedition on Pumori, Amadablam, Baruntse are considered the popular among 6000 & 7000 meter peaks where as Dhaulagiri, Makalu, Manaslu, Everest are the 8000 meter peaks for the challenging climbing in Nepal. We arrange fully guided and logistic support on Cho Oyu, Shishapangma and Everest in Tibet.Since Nepal has been open for Nepal Himalaya expedition, we Himalaya Journey Treks & Expedition has depth experience for arrange the all Himalaya expedition from 5500m to 8848m with amazing lifetime experince! 56 Days Mt. 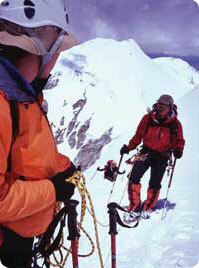 Dhaulagiri Expedition (8163m).